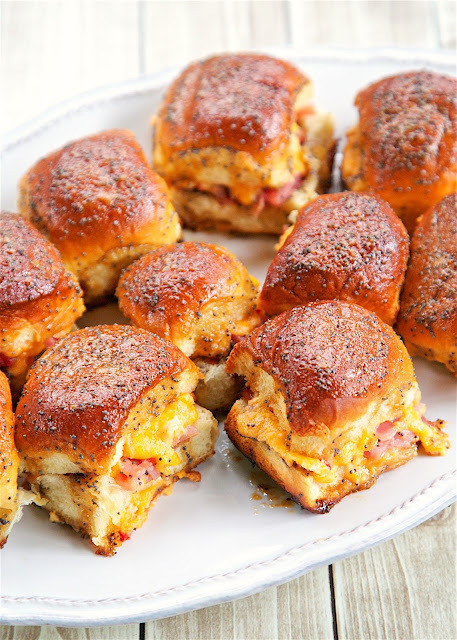 Hot Ham and Pimento Cheese Sandwiches - Hawaiian rolls, ham, pimento cheese topped with a sweet and savory butter poppy seed sauce and baked. SOOOO good! These are so easy to assemble - only takes a few minutes. Perfect for brunch, lunch or dinner. There are never any left! A new favorite! 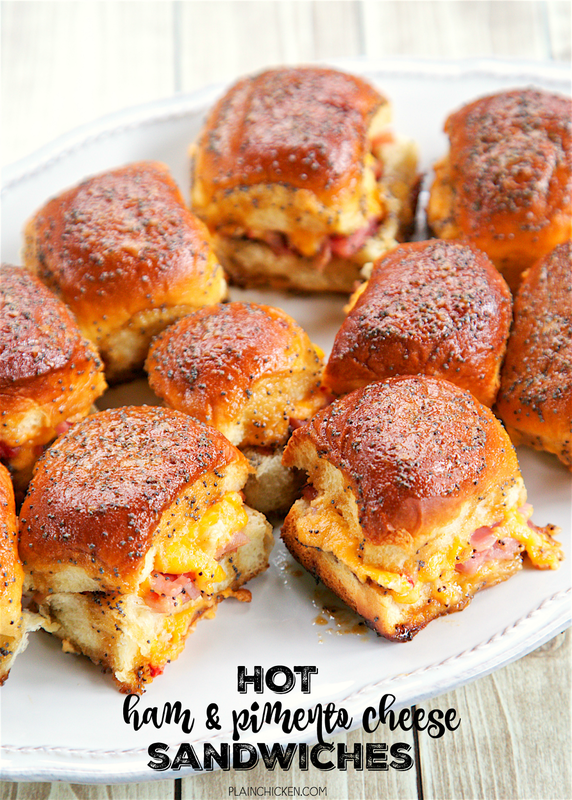 These Hot Ham and Pimento Cheese Sandwiches are perfect for parties! It's Masters week! Nothing says "The Masters" like a good pimento cheese sandwich. I have a great recipe for pimento cheese on the blog (I think it is better than Augusta's version), but I wanted to make something besides a regular pimento cheese sandwich. I came up with these Hot Ham and Pimento Cheese Sandwiches. They are, in a word, AMAZING! SOOO good!! Pimento cheese is a staple in The South. Every Southerner worth their salt has a pimento cheese recipe. In the simplest terms, pimento cheese is cheese, pimentos and mayonnaise. It makes a great dip, sandwich filling, or topping for burgers and sandwiches. You can put pimento cheese on just about anything and it will be delicious! Hawaiian rolls are stuffed with ham and pimento cheese, topped with a sweet & savory butter poppy seed sauce then baked. How could they be bad?!?! I ate WAY too many of these. You can make your own pimento cheese or use store-bought. If using store-bought, I prefer Palmetto pimento cheese. I've tried several brands of pre-made pimento cheese and Palmetto is hands-down the best. You can find it in the refrigerated section at the grocery store near the cream cheese. 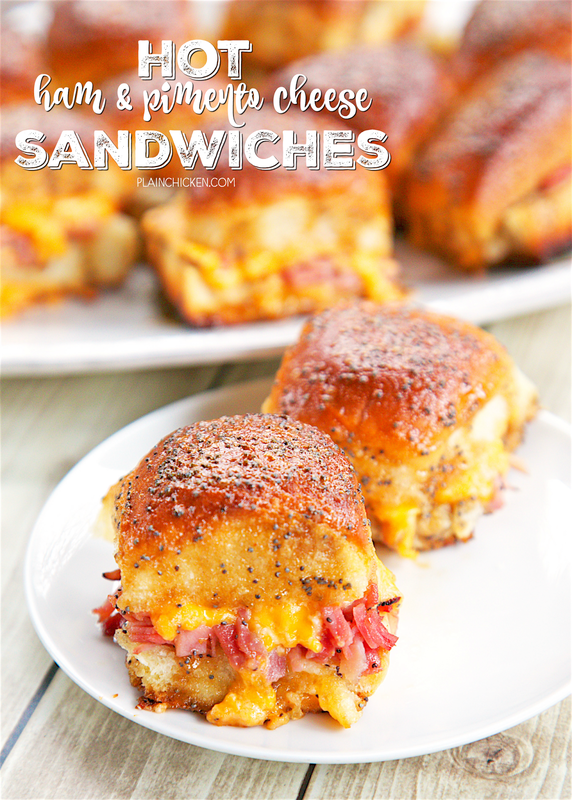 These Hot Ham and Pimento Cheese Sandwiches are great for brunch, lunch, dinner, tailgating and watching The Masters. I can promise you we will be eating these one day this week while wishing we were at the golf tournament! Split each dinner roll. 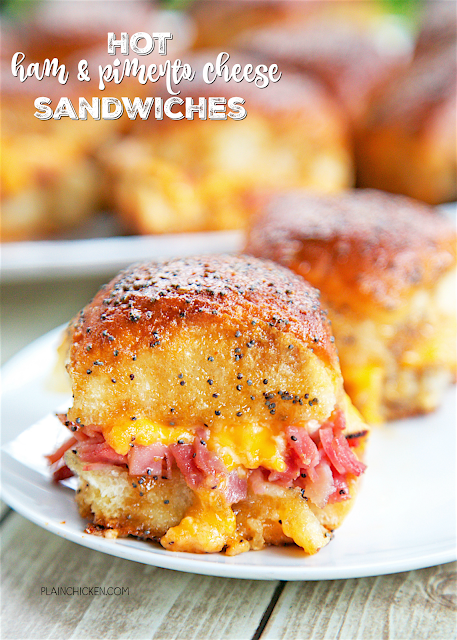 Make a sandwich of the ham and pimento cheese and the dinner rolls. Arrange the sandwiches in a 9x13 pan. Bake for 20-25 minutes, or until the tops are brown and crispy. There is one right under "Printable Recipe"
These look so good! I'm going to give them a try this week. Thanks for sharing your recipe. when cooking these and then taking them to a game works? do they get soggy? mine would have to be cooked at least 2 hours before the tailgate. Mine did not get soggy. Enjoy!